House of Fraser Sale is now on up up to 60% off everything! Enjoy the sale! House of Fraser is Britain's leading department store, and specialises in providing high-quality, premium fashion, furniture, beauty, and electrical items at affordable prices. House of Fraser plays host to a range of middle- and high-end and boutique clothing labels for both men and women. Brands such as Michael Kors, Jaeger, Diesel, and Paul Smith feature their latest creations in store straight from the runway. In addition to clothing, at House of Fraser you can find stunning luxury bedding you could happily get lost in for days, and stylish electrical appliances for the home. Take a look at what's on offer today, and give your wardrobe and home a makeover! Add House of Fraser to your Favourites list and be the first to know every time they have a Sale on! 1st January 2018 - House of Fraser New Years Day sales for 2018. 7th May 2018 - House of Fraser Early May Bank Holiday sales for 2018, add to your diary now! July 2018 - House of Fraser Summer 2018 sales, joining us? 23rd November 2018 - House of Fraser Black Friday sales in 2018 start on Friday 24th November. 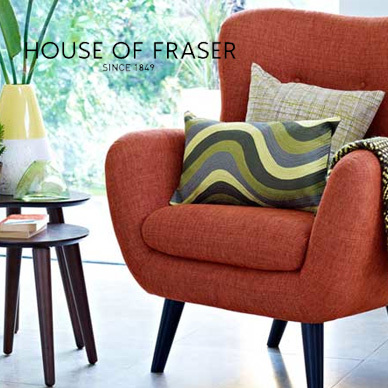 Add products from House of Fraser to your Love Sales list. Get the Love Sales button now! House of Fraser January Sale is now on up up to 60% off everything! Enjoy the sale! House of Fraser Boxing day Sale is now on up up to 60% off everything! Enjoy the sale! House of Fraser Christmas Sale is now on up up to 60% off everything! Enjoy the sale! House of Fraser Cyber Monday Event is now on up up to 60% off everything! Enjoy the sale! House of Fraser Black Friday Event is now on up up to 60% off everything! Enjoy the sale!